Dog adoption fee $120. Cat adoption fee $50 for a pair. For more, scroll to bottom. Please email for an application: CampChaos37206@gmail.com. 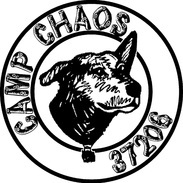 Camp Chaos 37206 is a 501c3 nonprofit organization since 2008. We are located in East Nashville, TN. We can transport Campers to approved adopters. We are not affiliated with Camp Chaos Puppy Rescue in Illinois. Countless adoptable animals await the arrival of their very own happily ever after. We wish you peace and gratitude for helping improve the lives of companion animals in the world! All of our adoptable dogs are indoor dogs with outdoor privileges. All of our cats are indoor cats unless specified as a feral or outdoor cat. We spay/neuter all Campers of Chaos, as well as vaccinate and deworm them. Adult dogs are tested for heartworms and treated when positive. Cats are tested for FIV & FLV. Please email for an application: CampChaos37206@gmail.com. Check your spam folder if you don't receive a reply in your inbox.